Gaming can be an incredibly immersing experience. Sometimes, you can play for hours and forget your own real-life commitments if you get settled into a good game. This is a peak experience that everyone should try at least a few times in their lifetime. However, nothing ruins your immersion quite like people talking in the background in the room with you when you are trying to concentrate on the game. That’s why a range of companies provide the solution; they build gaming headsets so that you can block out the outside world and concentrate on your game whilst you are gaming. Today we’ll talk about what could be one of the best gaming headsets that we have used and is said to be on par with the HyperX Cloud II and the Kraken. The Razer Tiamat Gaming Headset is being billed as the first ever truly 7.1 surround sound gaming headset. To this end, it has ten individual drivers which provide a seemingly true surround sonic experience. The manufacturers boast a truly customizable audio experience, with the ability to change every single audio channel and frequency level, meaning that the bass is editable. The audio channel is editable giving a wider range of experiences than the regular headset provides. Finally, the manufacturers list comfort is a feature. The leather pick-ups are designed to last for a long time and provide comfort for all the time that you use them. We’ll talk about whether this is a success or not in the next section. The Razer Tiamat Gaming Headset has a lot to recommend it. Generally, the features that are listed above are in fact true. This manufacturer has not overemphasized any of the good points. For instance, you really do get an immersive sound experience with the Razer Tiamat gaming headset. It does actually perform a lot better than a lot of its competitors. Some might argue that it is too powerful, but seeing as this is the advantages section we will just leave it at an acknowledgment that this headset performs incredibly. The headset is also very comfortable. With a lot of headsets, you tend to get a sort of fatigue over your ears after wearing it for a couple of hours. That’s if it’s good quality. Poor quality headsets wear on your ears from the minute you put them on. You could comfortably wear the Tiamat headset for a long time. No product is perfect. Whilst the Tiamat has incredible bass and general sound quality, and it is very comfortable, we feel that in the interests of being fair we should talk about some of the cons of the product. Unfortunately, we can’t really think of any, so we will leave it with the explanation that this is not a cheap headset. However, to conclude, we think that this is a very high-quality gaming headset. We are pretty sure that if you are a serious gamer in any way, you find that the Tiamat gaming headset is more of an investment than an expense. One of the best headsets released by Razer, full 7.1 surround sound quality providing an immersive experience. 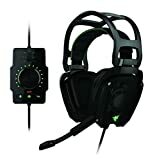 Performs exceptionally well, whilst providing a nice fitting headset that is comfortable can be worn for hours gaming.